What’s more comforting or satisfying than a beautifully roasted chicken with fresh root vegetables? And how wonderful does the kitchen smell while everything is cooking? The following recipe was prepared and shared with us by our friend, the late Chef Jim Whaley. It is an adaptation of Thomas Keller’s Roast Chicken with Root Vegetables. Remove the chicken from the refrigerator and let stand at room temperature for 1 ½ to 2 hours, or until it comes to room temperature. Preheat CVap® Cook/Hold Oven to 170/10. Remove neck and innards if they are still in the cavity of the chicken. Using a paring knife, cut out the wishbone from the chicken. Generously season the cavity of the chicken with salt and pepper, add 3 of the garlic cloves and 5 sprigs of thyme, and massage the inside of the bird to infuse it with the flavors. Truss the chicken. Cut off the dark green leaves from the top of the leeks. Trim and discard the darkened outer layers. Trim the root ends, cutting them on a 45-degree angle. Slit the leeks lengthwise almost in half, starting ½ inch above the root ends. Rinse the leeks well under warm water. Cut off both ends of the rutabagas. Stand the rutabagas on end and cut away the skin, working from top to bottom and removing any tough outer layers. Cut into 3/4 inch wedges. Repeat with the turnips, cutting the wedges to match the size of the rutabagas. Combine all the vegetables, remaining garlic cloves, and thyme sprig in a large bowl. Toss with 1/4 cup of the oil and season with salt and pepper. Spread the vegetables in a large cast-iron skillet or roasting pan. Rub the remaining oil over the chicken. Season generously with salt and pepper. Make a nest in the center of the vegetables and nestle the chicken in it. Cut the butter into 4 or 5 pieces and place over the chicken breast. Put the chicken in the CVap Cook & Hold Oven and roast for 1:15, or until the temperature registers 160° F in the meatiest portions of the bird and the juices run clear. Transfer the chicken to a carving board and rest. Just before serving, set the pan of vegetables over medium heat, turning and glazing them with the pan juices. Burger Season is Upon Us. Prepare to Gobble! Memorial Day is upon us. It’s a time to reflect on the sacrifices of our men and women in uniform. It’s also the official start of the summer season. Think summer foods, and the first thing that comes to mind is burgers. Here’s a delicious twist on burgers – made better with CVap (of course). Not only does Memorial Day begin summer, it also immediately precedes June – a.k.a. National Turkey Lovers’ Month. So what does that mean? 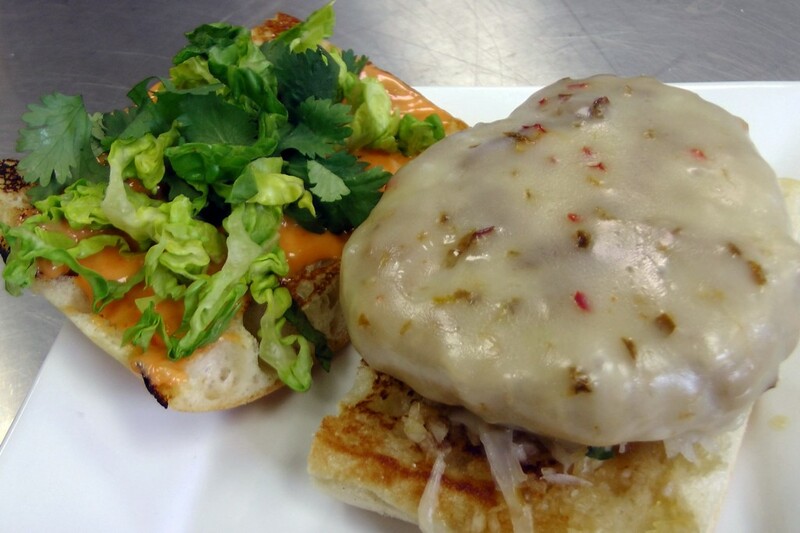 That’s right – turkey burgers! 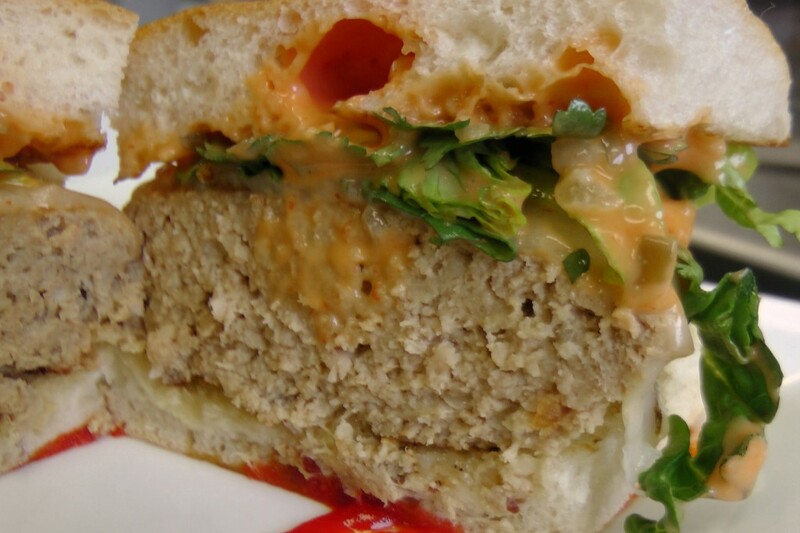 But not just any turkey burgers – these burgers started with CVap Staging. 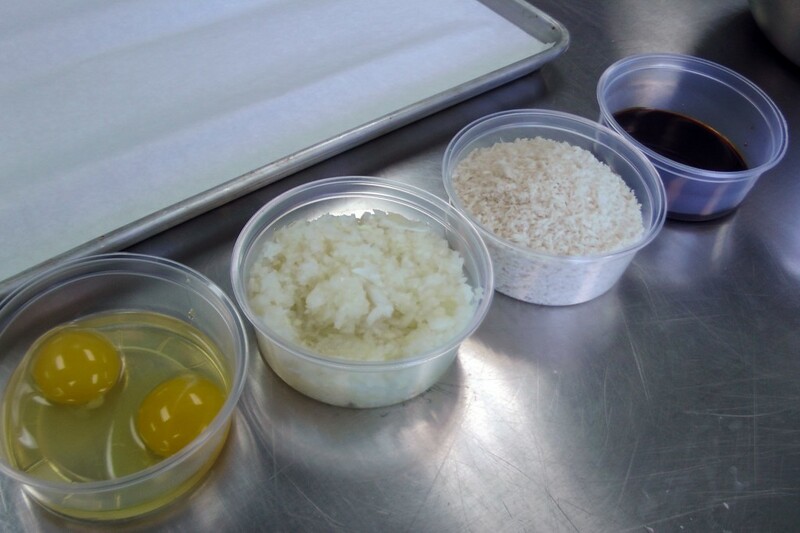 For this post, we experimented with two different approaches, though our base mixture was the same for both. We combined ½ lb. of ground turkey with two beaten eggs, ¼ cup of Bourbon Barrel Soy Sauce, ½ of an onion (minced), One minced garlic clove, and one cup of Panko bread crumbs. Once the mixture was gently combined, we formed 3-ounce patties and put some on a parchment-lined half-size sheet pan. Eggs, minced garlic and onion, Panko, and soy sauce. Ground turkey. Gently knead other ingredients into meat. 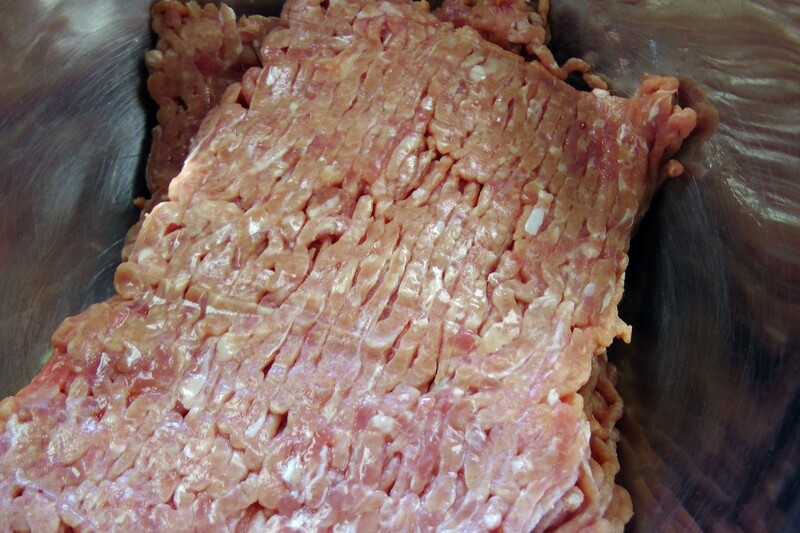 Ground turkey mixture formed into 3-oz. patties. Half were placed on parchment-lined tray. The other half of the patties were vacuum-sealed with a little added smoke. 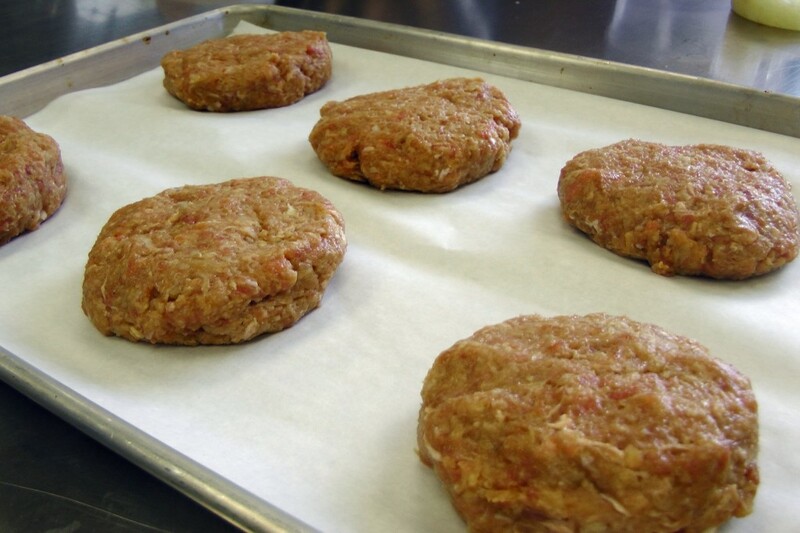 All of the patties then went into a CVap Cook/Hold Oven with Constant Cook ON, a Food Temperature (Doneness) setting of 145°F and a Food Texture (Browning) setting of 0, for 30 minutes. To finish the patties, we pan seared them for texture and brought them to a finished temperature of 150° to 155°F (though tossing them on a grill for quick finish would work equally well). CVap Staging and then finishing in this manner yielded extremely well-textured, moist, and flavorful burgers. Pouched turkey patty, finished by searing on grill. Patties CVapped in a pouch fit perfectly on ciabatta buns. 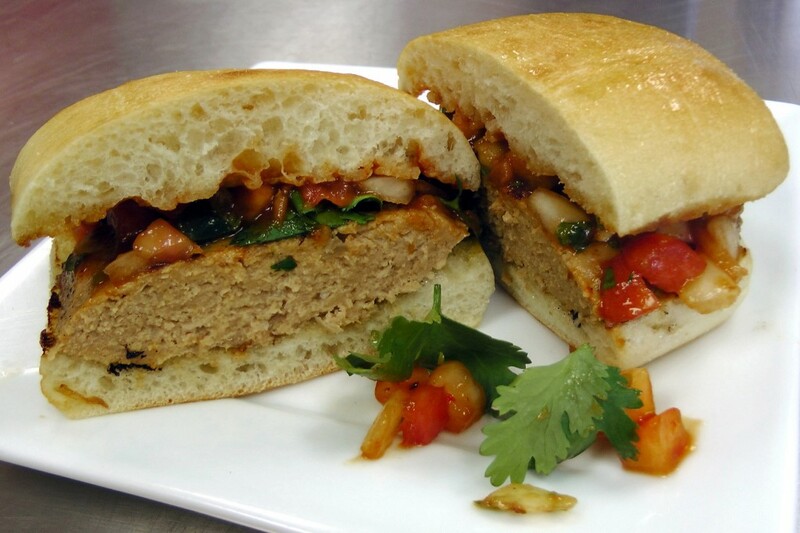 Asian-influenced traditional patty with Sriracha mayo, onion, soy sauce, minced ginger and garlic, baby lettuce and torn cilantro. 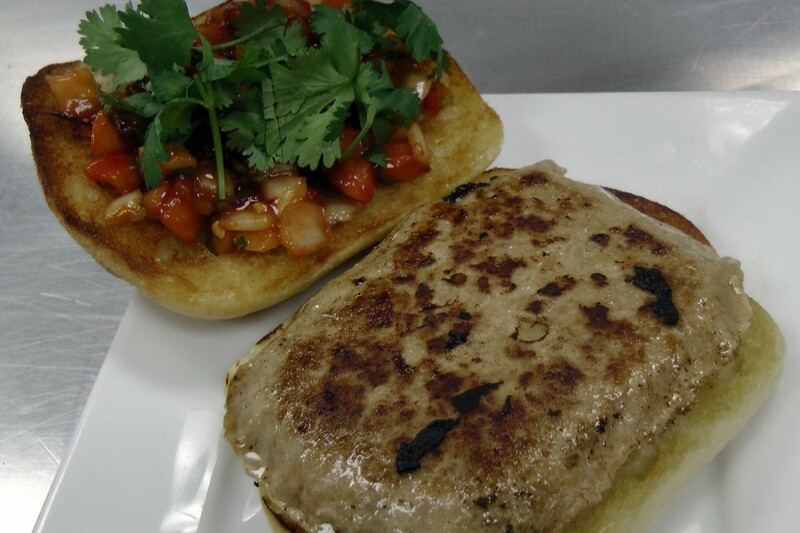 Traditional patty dressed with Asian flavors. Note the even doneness – a hallmark of CVap cooking. For more information about the complete line of CVap products, please visit our website at winstonfoodservice.com . Everyone’s fried chicken is the best! Or everyone has a grandmother that made the best fried chicken. I get it, I really do! Everyone has their own techniques, tricks, and superstitions when it comes to making their “famous fried chicken.” Well, my fried chicken is never the same. I do not prefer one technique over another. I am a fan of all styles. I don’t care if its buttermilk fried, Korean fried, or country fried – as long as it’s delicious and crave-able! Below, I have a recipe for a damn good piece of fried chicken. And at the end of the day, I really think that is paramount! What makes this particular recipe great, besides that it tastes so good, is the fact that it is less greasy and can be prepared, mostly, ahead of time. CVap is the KEY to all of this. What I have done is reduced the fry time from 12-ish minutes down to 3-ish minutes, resulting in a super moist, less greasy, and crave-able fried chicken. A quick tip: the less time the chicken is in the oil, the less grease the breading will absorb! The day I prepared this, I wanted something with Asian flavors. So that’s where my approach came from. Let’s get into the details of the process! Place all the ingredients for the brine in a small sauce pot and bring to a boil. Once boiling, place a lid on the pot and turn off the heat. Cool to room temperature. Strain and cool in refrigerator until it goes below 40F. Heat the CVap Cook and Hold to 155 F + 0F, Constant Cook On, time of 3 hours. I prefer thighs and legs of the chicken for my fried chicken so that is what I used. In two freezer bags, I placed six pieces of chicken in each bag and split the brine between the bags. When closing the bags, try and remove as much of the air as possible to ensure that the chicken is making contact with the brine as much as possible. Once your CVap is to temp, load the chicken and press Start. Tip: For older chickens or larger cuts of chicken, increase the cook time to 4 or 5 hours. This will help breakdown the connective tissues and make it much more tender. As the chicken is cooking, prepare the breading. There is a wet and dry step. For the wet I mixed equal parts buttermilk and coconut milk. The flour, I used bread flour because there is higher protein in bread flour. Higher protein makes for a better crunch! When the chicken is close to being done, prepare your pot of oil. You will want to use peanut oil because we will be frying 390F to 400F for this round. Tip: Cover your stove with foil to make cleanup much easier! Once the chicken is done and you have the oil heating, remove the chicken from the bag and pat it dry with paper towels. 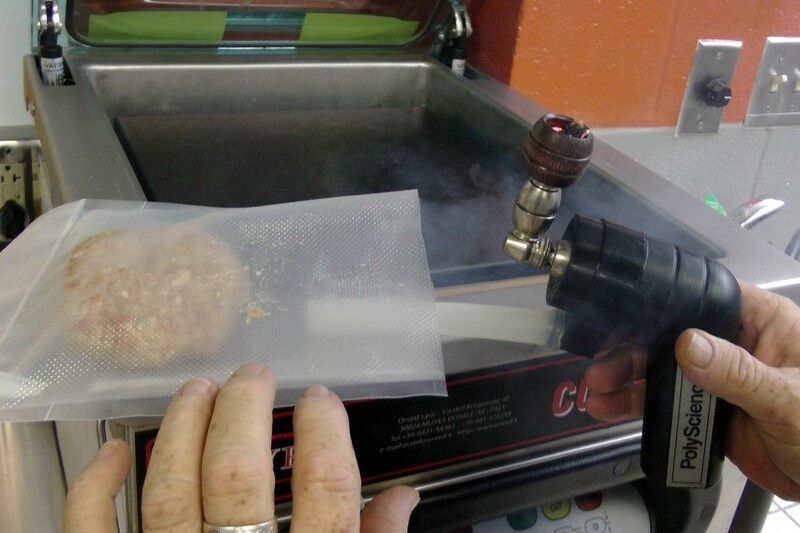 When your oil comes to temp, turn down the heat to maintain that temperature and start the breading process. Dip the chicken in the wet mixture first and move to the flour mixture and back to the wet and back to the flour. That’s how you get EXTRA CRISPY. If you do not want extra crispy just go through the process once. You will want to do about four pieces at one time as to not overload the oil and you don’t want the chicken to sit breaded as it gets gummy. Carefully put the chicken into the oil. When it is in, increase your heat on the oil to bring the temperature back to 390F – 400F. Since the chicken is already cooked, all you are trying to do is brown the breading! About three minutes in the oil will do. When you have reached your desired color, remove the chicken from the oil and let it rest on a rack. Season with a little salt. The nice thing about this is if you don’t want to fry all the chicken you do not have to. Leave it in the bag and place it in the fridge and the next day you can fry the chicken from cold. You will need to heat the oil to about 330F – 340F, but the rest of the process remains the same. The cook process will take longer, about 8 minutes, but hey it’s still packed with all that flavor and the chicken is already cooked! I topped mine with a mixture of sesame, scallions, soy, chili paste, lime and fresh ginger. Enjoy! Summer is by far my favorite time of year. It is an escape from winter. The sun is out, the birds are chirping, the flowers are blooming. Millions upon millions of people leave their dens of hibernation for the great outdoors. But to me, there are three things that truly signal the beginning of spring: baseball, beer, and BBQ. Today we will be focusing on the king of grill toppers, ribs! My normal procedure for baby backs would be 225 degrees on my smoker for 4-5 hours. But that limits me to only cooking and eating ribs on the weekends and I’m way too greedy for that. Luckily, I have a CVap Cook and Hold! This technology allows me to cook the ribs beforehand in the oven and have them holding until I get off work. I can then finish them off on the grill at my convenience. 1. Remove membrane and sprinkle salt on both sides of the ribs and allow them to dry brine overnight. 2. Mix together all dry ingredients in a bowl to create your dry rub. 3. Rub a thin layer of vegetable oil on the ribs and then coat with dry rub. 4. Place ribs on half size sheet pan and put them into the Cook and Hold oven. Finally, fire up your grill and baste ribs in your favorite BBQ sauce. When the grill is at its hottest, place ribs directly over heat to allow the sauce to caramelize and get some texture on the outside. Slice ribs and serve! How do you like your ribs? Fall off the bone? Texture with a bite? Smoke or no smoke? Baby back or St. Louis Style? Dry rub? Saucey? Grilled, baked, boiled – don’t even go there! Oh My! Between the questions and the debate almost everyone has an opinion on how they like their ribs. Here is my new favorite recipe that includes smoking and CVap cooking, blending a combination of techniques to get ribs that I am proud to share. I have made numerous different dry rub recipes, tried store bought and then found a recipe that has become my go to! It is Meathead Memphis Rub and it will make your ribs OUT OF THIS WORLD! I Started using this dry rub a few years back and haven’t changed since. Next, go with your favorite rib, I’m using St. Louis style. Trim excess fat and shiny membrane from the back of the rib. Using a paper towel to pull off the silver skin makes the job easier. Generously cover ribs with Meathead Memphis Rub. Time to start your smoker! I’m using a Green Egg. Light high quality lump charcoal and bring the smoker to 225-250 degrees. For this recipe, I like a mix of Hickory and Apple wood. Add whichever wood chunks you prefer and let’s get smokin! Once smoke is billowing out, add the ribs. Cook for 2 1/5 hours on the smoker. Add wood chunks as necessary. I have found that smoking ribs for 4 hours can end up with a dry rib. After the smoke, I move the ribs to CVap for the perfect balance of smoke, bite and tenderness. Cook in CVap for 1.5 – 2 hours at 180 degrees Food Temperature and +40 Food Texture (Browning). CVap has the ability to precisely finish cooking. Winston CVap Cook and Hold for 1½ to 2 hours at 180d Food Temperature and +40 Food Texture (Browning). Oh, look at the bark! Tender moist ribs, still with a little bite. YUM! top with drizzle of local honey and a few tablespoons of butter. Put back on 350 degree grill to heat through and to melt the butter and honey. Serve now. If you like sauced, sauce on grill, flip and sauce other side. If you want to serve the next day, after CVap chill and reheat the next day following the above grill instructions. One sauced, one not. We are here to please all rib lovers! It shouldn’t be a surprise that BBQ is very hot right now! I know not everyone has a smoker in their kitchen, but I follow two websites pretty closely for great information about BBQ and food techniques. The best resource for BBQ that I have ever found is Amazing Ribs and for technique, especially sous vide, I always go to Chef Steps. While browsing through Chef Steps I found their method for “Apartment Ribs”. Basically, the ribs are salted, bagged, and cooked in an immersion circulator set to 167 ° F for 6 hours for St. Louis style and 4 hours for Baby Backs. Then the ribs are blotted dry and painted with a mixture of molasses and liquid smoke before the rub is applied. Ten minutes in a 450° F convection oven to set the bark and caramelize the sugars and the ribs are done! Sounds easy enough, right? I wanted to duplicate the process using CVap and see how it worked out. I placed the ribs on a rack on top of a sheet pan and covered the ribs and pan with foil. This simulates the bagging you would need to do in an immersion circulator. I set the CVap for CONSTANT COOK then set DONENESS to 167 and BROWNING to 0. I set the timer for 6 hours and pressed start. Upon completion of the cycle, the CVap will revert to a 150 Doneness + 0 Browning hold setting. At that point, I blotted the ribs dry and painted with the molasses/liquid smoke mixture and applied a generous dusting of Memphis Dust Rub from the Amazing Ribs website. (this is a REALLY good rub that I use on just about anything BBQ). Ten minutes in a 450° F convection oven and they turned out perfect. People who have had my ribs from my smoker said that these were moister than usual! The ribs were perfectly cooked with a bit of resistance to the bite. “Fall off the bone” is overdone – and highly overrated in my opinion! If you don’t have to bite the meat off the bone, you will never win a competition. The slow, precise cooking from CVap is what made the difference and there was no loss of moisture with this method!